Keep up to date with Flex IT news. A new IT Technician has been appointed by expanding Shropshire IT Company, Flex Managed Services Limited (Flex IT). 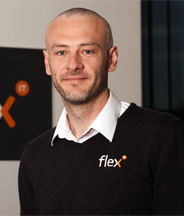 Simon Tierney joined Flex IT, based in Old Potts Way, Shrewsbury, to strengthen the team and help support the company’s expanding client base. Simon has gained numerous technical qualifications and is currently in the final stages of completing his Computing and IT Degree with the Open University. His studies have enabled him to develop his skills further, acquire an expertise in a wide variety of technologies and gain a thorough knowledge on the latest developments within the industry. Having worked in IT Support for over 10 years, Simon brings real value to the team. ‘Working on the Support Team has given me the opportunity to work with a range of different businesses in Shropshire’. Flex IT has been providing IT Solutions to clients for 15 years as part of local Accountancy firm, Dyke Yaxley. Director, Adrian Key recognised the opportunity to outsource Dyke Yaxley’s IT Services to clients and other local businesses, and since then the department has gone from strength to strength. To give the team more recognition and identification as a professional IT Solutions provider, the company rebranded as Flex IT in 2014. For more information on Flex IT and the team, please visit www.flexit.co.uk. Integrity, professionalism, the very best services and implementing cost-efficient solutions are at the top of our list.